Patented scissor allows you to adjust spacing between the teeth for a desired effect. NEW PATENTED DESIGN!!! This advanced 3-in-1 texture tool is engineered with state-of-the-art Patented Technology, which allows you to adjust spacing between the teeth for a desired effect. Turn the dial and remove 15, 25 or 35 percent of the hair, going from soft to a more aggressive texture. Thanks to the variable blade positioning (see photos below) each selected setting achieves a distinctly different look. 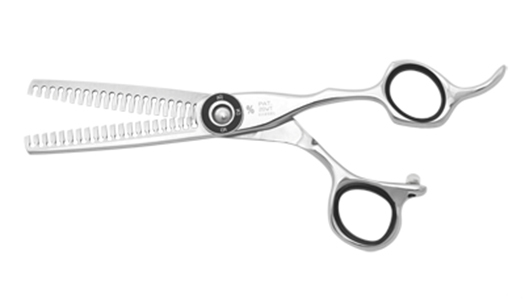 This revolutionary shear is available exclusively from WASHI! It's a must-have for any creative hair designer who is looking for convenience and speed.